Above is me at a weight of 195 lbs (88 kg) in April 2010. Then me in February of 2012 at 152 lbs (69 kg). My story starts out about 40 years ago. I was in my early twenties when I developed a double hernia. At the time I was at a normal weight for me. I am 5’8” (173 cm) and weighed around 160 lbs (72 kg) with a body fat of probably 7–10%. I had surgery to correct my hernia and couldn’t work for 6 weeks after the surgery, and I gained 25 pounds (11 kg), all fat. After this I always had trouble getting and keeping my weight off. In the mid eighties I went back to school for a few years and did nothing but go to school and study and my weight went up to 212 pounds (96 kg). When I started a new job they required a physical. When I got the paper work back from the nurse I was shocked to see my body type was obese. I started a diet that day, using Slim Fast. I actually lost down to 185 pounds (84 kg) having 2 shakes a day and 1 meal, but I got stuck there and decided I need to exercise so I took up running. I ran approximately 25 miles a week and lost a little more. 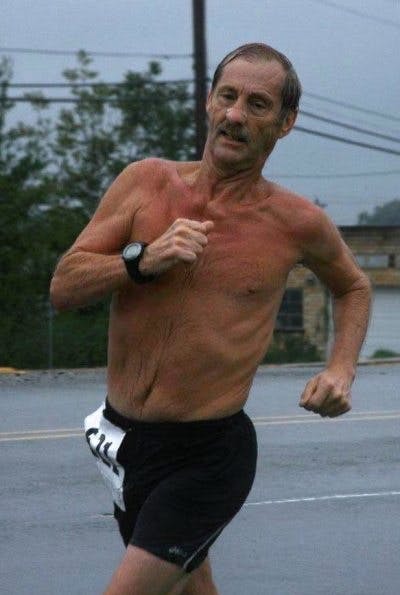 I started running in 1988 but actually didn’t start recording my weight until 1999 and tracking my body fat until 2001. My weight always fluctuated from 160 to 195 lbs (72–88 kg) depending on my running, injuries and the time of the year (Holidays). In 1996 I trained for the Dallas Marathon and ran several 60 & 70 mile weeks and two 80+ mile weeks and still couldn’t get my weight below 162 (73 kg). In 2002 when I was running the Grand prix series I actually got down to 150.5 pounds (68 kg) and stayed in the mid 150’s for 3 months until I got injured. Going into 2004 I was injured and weighed 188 pounds (85 kg) and decided to go on the Atkins diet. I stayed on the Induction phase for two and a half months and lost 26 pounds (12 kg) and ate as much as I wanted. However, I noticed the longer I was on it, the less I wanted to eat, some days as little as 1000 calories. My wife didn’t think it was healthy for me and didn’t like how my breath smelt so I got off of it, and promptly gained my weight back. In June of 2011 my heart started skipping several beats a day, (I later found out by wearing a 24 hour monitor it was 1034 beats that day). I decided to see a Dr to make sure it was OK. They wanted to do a stress test and I agreed to do one. At the time my weight was 193 lbs (88 kg) my body fat was 29 % and my visceral fat was 14 %. The Dr had me bring in my lab work from my job (we get a physical every year) and he told me my cholesterol at 215 (5.6 mmol/l) and LDL at 154 (4.0 mmol/l) was high. Although he didn’t mention my HDL, it was low at 35 (0.9 mmol/l) and my triglycerides were 129 (1.46 mmol/l). He put my on a statin and told me to come back in 2 months. Well, I took the statin for 2 days and my brain was so foggy I couldn’t do my job, so I stopped taking it and decided to try and lower my cholesterol on my own. I started researching how to lower cholesterol and came across Dr. Robert Lustig’s video The Bitter Truth. After watching that video I quit all liquids with any sugar in them. I did lots more research and started eating more fruit and vegetables. After two months of this, my weight had dropped to 165 lbs (75 kg). I went back to the heart Dr. They did some blood work and my total cholesterol went to 162 (4.2), my LDL went to 110 (2.8), my HDL went to 44 (1.1) and my triglycerides went to 57 (0.65), but he was still concerned about my LDL being 110. So I did some research about cholesterol and found that most of the new research was saying total & LDL cholesterol wasn’t as important as LDL particle count, which is predicted by trig/HDL. I eventually cut out most starchy foods, then breads and cereals. Eventually I quit eating almost all processed foods, including artificial sweeteners, trans fats and vegetable oils. I now eat basically a low carb diet, with healthy fats. The last labs I had, showed the following lipid profile. Total cholesterol 199 (5.1) triglycerides 51 (0.58) HDL 70 (1.8), LDL 119 (3.1) and new to the test my VLDL was 10 (0.26). So I am happy with how things are progressing and I am on absolutely ZERO meds. And by October of 2011, my weight was down to 150 lbs and has stayed within 5 lbs of that for over 3 years. My body fat went to 10 % and is now between 12–15 % and my visceral fat went to 6 and is now 6 or 7. 7. Weight went from 193 to 149.5 lbs and stayed in low 150 for 3 years. 7b. Body fat went from 26 % to 10 % and visceral fat from 14 to 6 using home scales. 8. Blood pressure went from mid 140/mid 90 to 100/60. 10. At my 2011 work physical, the Dr told me I had a slightly enlarged prostate – in 2012 he didn’t mention it so 2013 I asked him if it was Ok and he said it was normal again and that it must have shrunk. Well, someone's got to say it: Way to go Ron! Indeed, wtg and keep it up! Hi Andreas, Paul from Cape Town, South Africa here. Is it possible to get in contact with Ron. So inspiring- obviously a man who has spent effort to get healthy and has tried many diff combinations of diet/exercise etc. 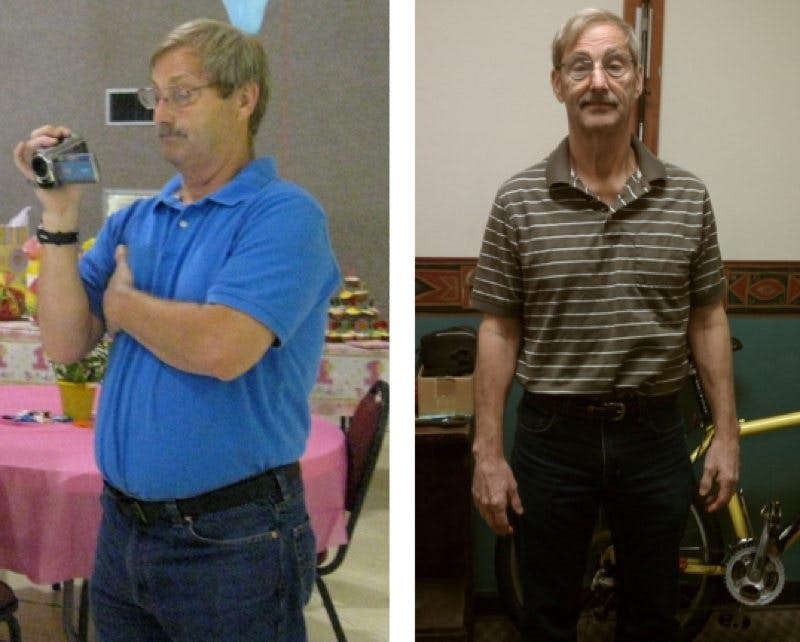 Now to have success with LCHF is a true testament. Thank you for posting! I am on lchf and still take statins (much lower dose) I too have a persistent ringing in my ears - is there a connection? wonderful success story, what do you use for a sweetner? The only conecction is hyperlipedemia.. but thats what you get Statins for. Tinnitus is just a sign, it could be anything like age. Dont forget to take your Q10, becuse statins lower the production of Q10. to lose weight as well as inches around the waist . Cannot run as I have problems with my feet , have stopped drinking any alcohol but am not losing weight am 76 yrs young . Heres a basic dietplan to start with.. to get in to the thinking! Paul, what the ringing in the ears was, when I went to bed at night and it was quiet I heard a high pitch noise or ringing. It would keep me awake most nights until I finally got sleepy enough to fall asleep. But after going not just LCHF but also I quit vegetable oils, artificial sweeteners, Trans fats and processed salt I just noticed one night it was gone.